You can target 1 "Number C39" monster you control; equip this monster from your hand or your side of the field to that target. The equipped monster cannot be destroyed by battle. At the end of the Dam.. When this card is Normal Summoned: You can target 1 "Utopia" monster in your Graveyard; Special Summon that target. You can target 1 "Number C39: Utopia Ray V" you control; equip this monster you cont.. When an opponent's monster declares an attack: You can banish this card from your Graveyard, then target 1 Spell Card in your Graveyard; send the top card of your Deck to the Graveyard, and if you do,.. If this card is in your Graveyard: You can target 1 "Utopia" Xyz Monster you control; attach this card from the Graveyard to it as an Xyz Material. You can only use the effect of "Xyz Agent" once per .. When this card is Normal Summoned: You can Special Summon 1 "Super Defense Robot" monster or "Orbital 7" from your hand. Once per turn, when exactly 1 "Super Defense Robot" monster or "Orbital 7" (and.. When this card is Normal Summoned: You can Special Summon 1 "Super Defense Robot" monster or "Orbital 7" from your hand. Once per turn: You can target 1 "Super Defense Robot" monster or "Orbital 7" yo.. When this card is Normal Summoned: You can Special Summon 1 "Super Defense Robot" monster or "Orbital 7" from your hand. Once per turn: You can banish 1 Machine-Type monster from your Graveyard, then .. When this card is destroyed by battle and send to the Graveyard while attacking a monster: You can Special Summon 2 "Umbral Horror" monsters from your Deck. You can only use the effect of "Umbral Horr.. When this card is Normal or Special Summoned: You can target 1 "Umbral Horror" monster you control or in your Graveyard, except this card; this card's Level becomes the current Level of that monster. .. If you control a Beast-Warrior-Type "Bujin" monster: You can banish this card from your Graveyard, then target 1 face-up card your opponent controls; destroy that target. You can only use the effect o..
During damage calculation (in either player's turn), if a Beast-Warrior-Type "Bujin" monster you control battles an opponent's monster: You can send this card from your hand to the Graveyard; the ATK .. If this card is sent to the Graveyard for the Synchro Summon of a Machine-Type monster: Special Summon 1 "Mecha Phantom Beast Token" (Machine-Type/WIND/Level 3/ATK 0/DEF 0), also, for the rest of this.. Cannot be used as a Synchro Material Monster, except for the Synchro Summon of a Machine-Type monster. The other Synchro Material Monster(s) are "Mecha Phantom Beast" monsters in your hand or on your .. 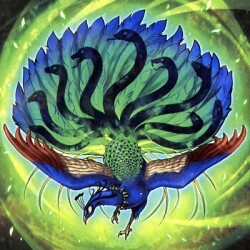 When this card is Special Summoned: Special Summon 2 "Mecha Phantom Beast Tokens" (Machine-Type/WIND/Level 3/ATK 0/DEF 0). You must control another "Mecha Phantom Beast" monster to activate and resolv..
Once per turn, when a monster(s) you control is Tributed to activate a card or effect other than this card's: Special Summon 1 "Mecha Phantom Beast Token" (Machine-Type/WIND/Level 3/ATK 0/DEF 0). This..